Randomness in Gaming: Good or Bad? Game designer Greg Costikyan has posted a transcript of the presentation he gave at the 2009 Game Developers Conference in Austin, in which he talked about the role of randomness in gaming. Games come in all forms, some purely skill-based while others are highly, or even completely, dependent upon the luck of the draw. It can be a frustrating part of the experience, as our best laid plans are brought low by the capricious whims of the universe, but it's been an important part of the whole for as long as gaming has existed. "Randomness has been part of games since their earliest inception -- and when I say 'earliest inception,' I mean deep into the unwritten Neolithic past," Costikyan said. "Game scholars sometimes point to The Royal Game of Ur as the earliest known game, and in a sense it is - but we also know of games from any number of Neolithic cultures that survived into the modern era, many of them documented by Stewart Cullin in a series of books for the Smithsonian, published in the early 20th century." Yet the reliance on chance, he noted, doesn't necessarily mean the outcome of a game will be random. 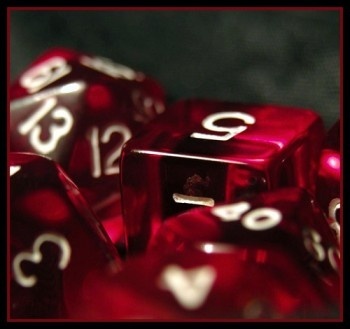 "In a game with chance elements, there will typically be dozens or hundreds of random tests over the course of the game -- many, many times in which dice [are] rolled, or an algorithm that uses a random number as an input applied," he noted. "Paradoxically, the greater the number of random tests, the less effect chance has on the outcome. Over time, random systems regress to the mean." Costikyan also explained that even some games that appear to be entirely skill-based can have random elements at work under the hood; FPSes, for instance, introduce a random element in weapon damage which isn't enough to cause any surprises in solo play but in multiplayer, introduces "enough variability in a system of chaotic fireplay to prevent a non-random system from becoming dull." For anyone interested in the intricacies of game design, Costikyan's presentation is a fascinating and detailed look at the role of randomness in an ordered system. "If randomness dictates outcomes, many players will find the game unsatisfying," he said. "But there are times when a degree of randomness plays an important, and useful, role in a design." Check out the whole article at playthisthing.com. Sound bloke, got to play with him once and you know instantly where Friend Computer came from. i think randomness is a good thing in games as longas its in moderation.As everything in life is down to luck but it doesnt mean working hard for something or being better is worthless its just your giving yourself better odds. randomness in games is usually good. all board games use it, and i like board games. I usually like a certain element of randomness, as long as it doesn't get out of hand. Some genres tend to rely heavily on random rolls, such as RPGs and Strategy games. However, there should be a limit. The Randomness should be the deciding factor when two mostly even forces meet, or a slight edge here and there, it shouldn't turn the tables totally and take all control out of a player's hands. Ack! Another hack gamer "genius" looking for the holy grail of gaming! Maybe that was too harsh. Let's take a closer look. Costikyan says that skill games are always legel, and random games are often illegal when played for profit. Actually skill games are just as illegal when played for profit in some jurisdictions. There are other reasons why casinos don't feature strict games of skill. Furthermore, his example of Texas Hold'em leaves much to be desired. I've seen poker players play blind as to the cards (completely removing Costikyan's suggestion that they are using statistics to win) and still win. Does he not understand poker as a psychological game apart from the cards? His summation was a failure in it's own right. Costikyan says, "If randomness dictates outcomes, many players will find the game unsatisfying(.)" When I was in a cards group playing daily, the Rummy section (random game) was far bigger than the Spades and Hearts section (skill games). Which players did Costikyan use as his sample for that statement? Either he hasn't said much (as many players also find games of skill unsatisfying) or he's trying to sneak in the opposite, that games of skill are preferable to games of chance. I liked the article over-all, and I look forward to reading in detail. However I found a host of other flaws, more than I wish to list here. Costikyan needs to go back and do his homework. A lot of it. Randomly assigned, for his benefit. Unavoidable randomness can be pretty bad where randomness will determine the whole outcome (see Mario Party) without the player being able to do anything about it, but situations where a random event might happen that the player can strategize around is almost always a good challenge except in the cases where it might warrant excessive amounts of repetition. It depends on the game. Damage variance is a type of random. You may have a string of bad rolls and get nothing but the lowest possible damage in the variance and lose a battle you should have won. Other times you might roll nothing but the highest. While, other times, you might be right in the middle getting a good mix of both. Really, it depends on the game, how it is being played, and other things. You don't want a skill based game to have many elements of chance just like you don't want luck based games to have many elements of skill. That explains his article: His brain has been fried by the Computer! I would have expected the writer of Paranoia to do a much better job handling this article. Then again, there may be a motivation behind his actions. What is he and the Computer hiding from us? What is he and the Computer hiding from us? What is your security clearance, Citizen? If by randomness you mean if my attack does 250 or 350 damage, then that's fine. but if by random you mean getting an item can actually HURT me, then no, not at all. I don't play Brawl anymore after I figured out it was one big game of luck. Diablo series handle randomness pretty well. I've heard some new randomization features in Diablo 3 which are outstanding. Normal distribution curves for the win. This is an interesting issue. Just look at a game like Unlimited Saga, in which everything is based on reels. Some (me) think it's amazing, while others think it's unplayable. Personally I like randomness. An example of stacked randomness? Mariokart. I dare anyone who's played 8 player multiplayer to look me in the eye and tell me that being first half way around the last lap is a good idea. I ended up playing the game with a "bodyguard". In other words, an unsuspecting player who I allowed to be in first (but not too far ahead), just to soak up the blue shells and lightning, then overtake him on the last corner. Hell, there were tracks when it was a good idea to be LAST on your way into the last lap. That's not random though... it happens every time. I think the Pen & Paper level up and roll system is outdated. They work great for determining the outcome of a game around a circle of friends and a GM, but that's because everything is imaginary and it's the only fair way to give a challenge. Early video game RPGs had roots in the TSR system but we should evolve from that. What developers seem to refuse to see is that there are actual virtual simulations being carried out, instead of it being all imaginary. So when I shoot someone in the head at point blank and blood decals are shown in say "Vampire: The Masquerade" and "Fallout", the chance system should not override that and claim I "missed" and did 0 dmg, or a shot in the eye should being 1. The player already has to grapple with dealing with his or her environments and taking careful aim with selected weapons and attacks. Why throw this randomness into the mix, when he/she has to already deal with so many variables. The experience would increase when the player gets adjusted to the game. Don't even get me started on turn based combat. It was bearable thirteen years ago and in a circle of buddies in one of your parent's basements. Again, video games can do better than that. I'm not going to politely stop my attack and finish up to wait for my opponent to strike. Turn based combat in video games is the equivalent of showing up to the movies for a slideshow. Furthermore, his example of Texas Hold'em leaves much to be desired. I've seen poker players play blind as to the cards (completely removing Costikyan's suggestion that they are using statistics to win) and still win. Does he not understand poker as a psychological game apart from the cards? Wrong. He described that quality of poker for an entire paragraph. The word "many" seems too complicated for you. It is true that far too many RTS don't randomize maps. It gets boring and stale for strategy. Also, how cool would it be if there was an FPS that randomly generated a new town everymatch? Randomness is fine as long as it doesn't go too overboard. Anything done using humans has randomness in it. Anything. One of my favourite ever games was Diablo (the first one not the rubbish sequel with stupid respawning enemies). I love the random maze generation and how all sorts of stuff was totally different every time you played. I played right through that game at least 20 times. I also enjoy the old ASCII games as well as Treasure Of Tarmin/Minotaur on the Intellivision for the same reason. Randomness brings massive amounts of replay value to a game and isn't used anywhere near enough these days. I was at Greg's lecture specifically because I wanted to see his take on how to use it. While he focussed a lot of randomness of outcome (damage, etc. ), he didn't cover much of the use of randomness in action selection. That is, using randomness (like the aforementioned normal curves) to provide variation in the selection of possible actions by NPCs. This is a major topic of my own book, "Behavioral Mathematics for Game AI", and was a component of my own lecture at GDC Austin, "Cover Me! Promoting MMO Player Interaction through Advanced AI"
This is an extraordinarily powerful use that makes for far deeper gameplay. As long as the actions that you are selecting from amongst are reasonable, there is very little disconnect from the point of view of the player. What we are simulating is the fact that people are different. Not every person is going to make the same decision given the exact same circumstances. We don't need to know WHY any given person makes slightly different decisions... we just need to simulate the fact that it happens. Terrible for competitive fighting games - look what competitive gaming did to SSBM - only 3 characters and a couple of stages are even viable for such a game. Which is why, if we are constructing games and/or game AI that is supposed to replicate human (or whatever) behavior, we need to lean on randomness in order to simulate this variation. depends on the context. In a serious game no. In a kids game or a lego game or a nintendo game then it usually works. I think randomization is one of the great formless powers designers can pull down and mold to their own needs. I particularly like it when these powers are applied to level design. I like structured randomization, a la Diablo 2 - it just mixes up the weapons and the landscape but tends to leave the enemies balanced to the player's ability and so on. It's one of the reasons that I'm looking forwards to Borderlands so much. randomness ok good for only certain games. Like in l4d, randomness ok, i don't wanna play a map four time and know were everyting is. Randomness in ff7cc bad idea, nothings worse than fighting sephiroth and getting five useless limit breaks in a row. OT: I think randomness has it's place and usefulness in games for certain things. In pen&paper games, it sometimes works...and sometimes doesn't. In Chaosium's CoC, I thought it added an element of frustrating realism. In Decima's Corporation, I found it really easy to pick up and deal with, and it added to the game without hindering. In some D&D games I've been in, dice have been a pain and adding this to that to that gets frustrating outside of the story. In card games, randomness is necessary for card dealing. To me, a random factor in a video game is a handicap for an AI that can't possibly match human thinking. You're fighting a boss, but there's also some element to the fight happens at random, sometimes it'll screw you over, and sometimes you can bypass it, but learning how to bypass it even in the worst of situations is how you truly master fighting that boss. Meanwhile, in a PvP situation I feel that random luck should not be even a subtle factor. After-all, a human doesn't need a handicap to make-up for his lack of ability to think on a human level (I should hope), so when you're playing a game against a friend, rival, random person, or whomever, you always feel cheated when some random stroke of luck gives him the upper hand and then he's on top for the rest of the match. Human vs Human should always be purely a game of skill (casual family games like Mario Party or board games being an exception), where Human vs AI pretty much needs to be down to a few random elements that help give the AI some edge to make-up for your ability to adapt and improvise beyond what's programmed. Turn off items, or the ones that are instakills. Problem solved. That's what me and my buddies do, though we leave in the less powerful items sometimes to make things interesting.